EXPOSITORY SERMON OUTLINES explain how to write expository sermon outlines with a structure that has sequence and flow. When I write expository sermon outlines, I follow four simply outlines. In the first step, you diagram the verbal movements in the passage of Scripture. You can either diagram the Greek text or simply look for the verbal movement in the English translations. For example, if you look for the verbal movements in 1 Peter 4:7-11, you will discover the verbal movements are: 1) the end of all things is at hand, 2) be alert in prayer, 3) be fervent in your love for one another, 4) be hospitable to one another, and 5) be ministers to one another. In the second step, you find the main verbal and the subordinate verbals. In the example above, the main verbal is The End of All Things is at Hand. The subordinate verbals are: 1) be alert in prayer, 2) be fervent in your love for one another, 3) be hospitable to one another, and 4) be ministers to one another. Once you have determined the main verbal from the subordinate verbals, you will need to ask the why, what, when, where, and how question of the main verbal. In the example above, the end of all things is at hand is referring to Christ's return. In light of that, Peter is telling his readers how to live in light of Jesus' return. Therefore, it is asking the how question. Peter is telling his readers what they must do in light of the nearness of Jesus' return. The exegetical outline would look like this: The means by which Christians live in light of the nearness of Jesus' return is by being a lert in prayer, by being fervent in their love for one another, by being hospitable to one another, and by being ministers to one another. In the third step, you would simply generate a sermon outline. That is, you devolep the main preaching point, sub-points and incidental points from the exegetical outline. In the example above, your main preaching point is Living in Light of Jesus' Return. 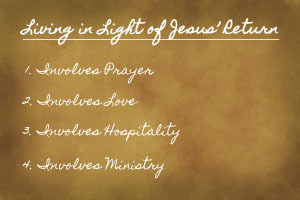 The sub-point are: prayer, love, hospitality and ministry. Notice that the expository sermon outline has a main preaching point, sub-points and incidental points. Moreover, notice how the main preaching point is linked to the sub-points by the linking word principles. I call this linking word the HINGE Word. For more information on HINGE words in expository sermon outlines, click on Expository Sermon Outlines. To view another example of an expository sermon outline, click on Free Expository Sermons. In the fourth step, you simply take your homiletical outline and turn it into a preaching outline. That is, you add an introduction, content to your expository sermon outline and a conclusion. Click here for more information relating to Sermon Outlines - Expository Sermon Outlines.